A wide array of health information technology is used in medicine today and more advances in medical artificial intelligence, including machine-automated algorithms, are currently in development. This will drastically change the medical field in regards to diagnosis, treatment, and record keeping. Machine learning and advances in technology are positioned to make a substantial impact on medical diagnosis and procedure. Improvements in technology involving healthcare has been positively received by both patients and doctors. Advances in the understanding of conditions and efficiency of diagnosis and treatment have given many a second chance at life and allowed doctors to help more people in their practice. Additionally, medical advances are beginning to allow patients in rural areas access medical professionals, information, and records digitally. 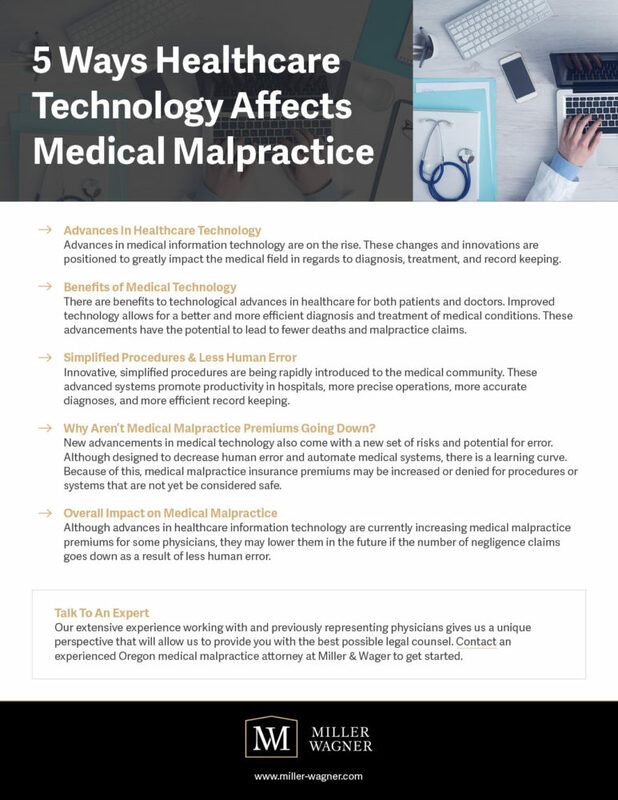 Advances in medical technologies have the potential to lead to fewer deaths and injuries as a result negligent medical malpractice. Innovative and simplified procedures are introduced to the medical field on a daily basis. This increases hospital productivity and allows for more streamlined and precise surgeries. Furthermore, technological advances in medicine have resulted in less human error not only in the operating room, but in medical filing and record keeping as well. Negligent record keeping can result in high rates of medical malpractice, and information technology can help reduce this risk. Why Aren’t Medical Malpractice Premiums Going Down? Although technology has the potential to decrease human error and medical malpractice, there is still a learning curve involved with the technological advances. Also, the advances cannot be tested or implemented without associated risks. All new medical technology improvements introduce a new set of risks and potential errors. While medical technology is designed to curb human error through automated systems, learning to use and implement these systems can be potentially hazardous. As a result, some physicians and hospitals are faced with higher medical malpractice insurance premiums or denied coverage on procedures that are new to the medical field and not yet considered safe. However, according to the New England Journal of Medicine (NEJM), “the liability implications of [technological advances] are likely to vary over the life cycle of the adoption of these systems.” In the future, health information technology could ultimately lower hospitals’ malpractice premiums if the number of claims goes down as a result of less human error. After the initial period of heightened risk, health information technology has the potential to reduce malpractice and negligent medical care. The NEJM also reports that “in addition to affecting the risk of a lawsuit, implementation of [new technology] may affect the course of malpractice litigation by increasing the availability of documentation with which to defend or prove a malpractice claim.” Unlike a telephone conversation or office visit, e-mail, online medical portals, and electronic transactions create a digital record which can be accessed in the event of a medical malpractice claim. Advances in healthcare technology have many benefits for patients, hospitals and physicians alike. These advances have the potential to result in simplified procedures, less human error, and better record keeping. The results will have a significant impact on both medical malpractice claims and insurance premiums. Contact Miller & Wagner today to if you would like an evaluation of your potential medical malpractice claim.